Les Arcs is a ski resort in France. You can view more Les Arcs ski reviews or write your own review. Fabulous resort. Good variety of runs from mogully reds to long relaxing blues. Fantastic snow park. One of the best ski runs in Les Arcs is the &#39;Ours&#39; piste. Set in the middle of the Tarrentaise with Val d’Isere on one side and the Three Valleys the other, the Ours piste offers skiers of all abilities of red and black standard great snow and easy access. A constant reference point is the massive vertical drop from the top all the way to the Valley floor and the Mont Blanc opposite. At sunset, there can hardly be a better way of ending a day. Iglu Ski were faultless, would definitely use again. Les Arcs, very good skiing with plenty of slopes for all abilities....avoid the French holidays at all costs as the kids ski schools are lethal on the slopes and there’s plenty of them. Les Arcs is a huge resort with so many possibilities. With access to La Plagne over the Vanoise Express cable cart, this gives skiers and snowboarders a huge 425km to explore during their week in the mountains. Arc 1800 is probably my favourite village to stay in as it is in the heart of the Les Arc domain with easy access to the long slopes towards Vallandry and the higher slopes up to Les Arcs 1950 and Arcs 2000. Arc 1800 is the busiest village with a lively apres scene with lots of bars and restaurants. The high altitude gives the ski resort fantastic snow quality and brilliant conditions throughout the season. I was surprised how good it was at the end of the season when I was there for a week in mid-April 2016! Les Arcs has a huge variety of pistes and some fabulous long leg-burning runs such as the Aiguille Rouge (3226m) down to Villandry, a vertical drop of 2000m. And in Arc 1800 there are some great restaurants and bars. Easy to get to, travel to Bourg-St-Maurice and then straight up the mountain by cablecar, or by flying to Grenoble/Lyon airports. Best value by far is self-catering as the euro exchange is not great. Ensure you get a ski-in-out apartment near the Transarc lift which accesses all the ski pistes, eg the Mirantin, Archeboc, Aiguille Grive Apartments. Also the Sherpa or Spar supermarkets in Arc 1800 have good food and wine and even rotisserie roasted chickens, pork hocks, etc. The ski passes are not cheap, but you can economise with a half-day 12.30pm+ afternoon pass or a 4-hour daily pass. 'Popcorn' are a good value ski hire shop. For a laid-back cosy evening try the Golf Hotel bar with its huge log fireplace and free live jazz music. Arc 1800 is the best of all the villages I think, though Arc 1950 has some good if expensive restaurants. 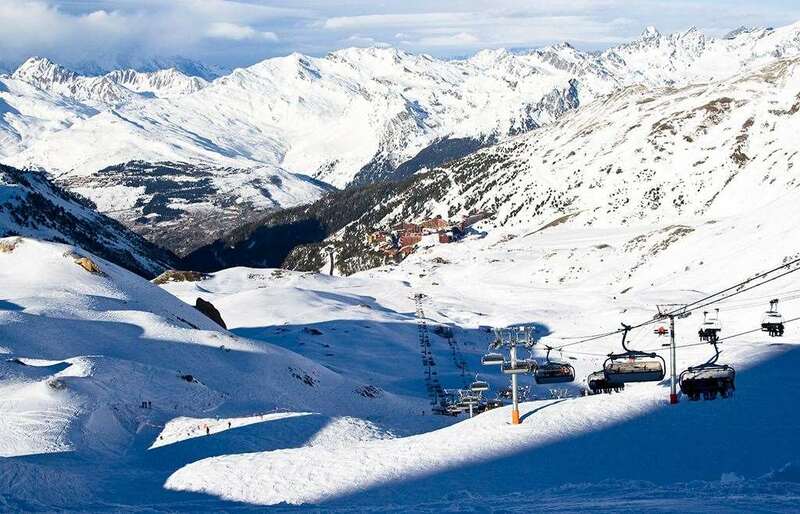 Les Arcs has the largest 'Paradiski' piste area in all of Europe with over 400km of pistes so it’s fantastic for intermediate skiers and snowboarders ... definitely worth a visit!